Do you want to get the most out of your presentation? Do you hate messing around with different presenter remotes? Install our app on your device, and have a professional presenter tool always by hand. The watch app provides a clear, user friendly interface with the essential elements. 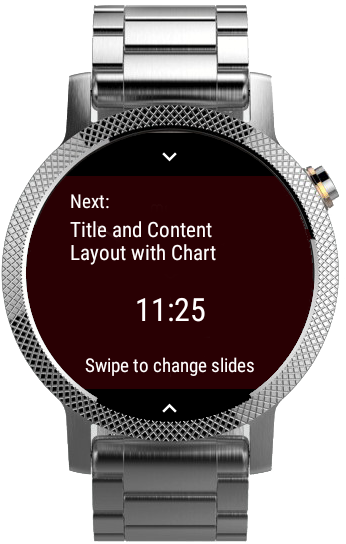 See the next slide’s title, and switch by swiping or with wrist gestures. The presentation remotes only have small buttons for changing slides. With our app, you can preview the next slide and view your slide notes. Swipe anywhere on the screen to change slides. Turn your phone or watch into a simple and safe pointing device, which you can use with every application. Based on several corporate and private presentations, we have collected the most wanted features, and created a simple app. Corporate presentations may require presenting others’ slides, while a great story line cannot break. This is why we show you what is on the next slide. If your story is in your notes, you can simply view them on a separate tab. Laser pointers can be hard to see in certain light conditions. This why we added a virtual pointer into our app. Most presenters have a small button for changing slides. With this app you may swipe anywhere on your screen to switch to the next one. You can also use the volume keys if you still need the physical thing. View the clock, or start a stopwatch to always know how much time is left of your presentation. Turn your wrist to change slides. Your hands can be free, so nothing will interfere with your non-verbal communication. To make sure you know what comes next even when you are walking around. You can also swipe to change slides, or use hardware buttons if available. The virtual laser pointer is also available from the watch. To make sure your presentation keeps on schedule, we show you the local time or the stopwatch. All Android Wear devices are supported.